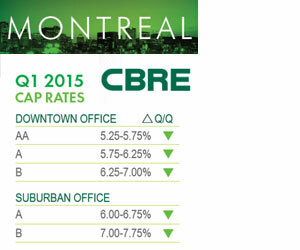 Competition seemed to be the name of the game in Montreal’s commercial real estate sector in the first quarter of 2015. “There’s a limited amount of assets that are being offered for sale, so there’s fierce competition at all investment levels across all asset classes to find the right asset to purchase,” said Alexandre Sieber, senior vice-president of CBRE, which just released its “Canadian Cap Rates & Investment Insights” report for the first quarter. Capitalization rates compressed by approximately 25 basis points for most asset classes in Montreal due to reduced borrowing costs, while the city’s office and industrial building vacancy rates dropped in the first quarter of 2015. Cap rates for downtown offices ranged from 5.25 per cent for AA buildings to seven per cent for class-B properties, according to CBRE, while suburban office rates varied from six per cent for class-A to 7.75 per cent for class-B. The office vacancy rate for the Greater Montreal Area (GMA) dipped slightly to just over seven per cent in the first quarter, and Colliers anticipates the office market slowing down slightly before accelerating again toward the end of 2015. More sub-leases are becoming available, but that trend is expected to stabilize. The two largest office development projects in Montreal are Ivanhoe Cambridge’s Manulife Building and Rester Management’s Extension Desjardin, which are both located on de Maisonneuve Street West downtown. From an investment standpoint, the GMA is coming off its second-best year ever after 2007 with more than $5 billion in investment for transactions of more than $1 million across all asset classes, according to Sieber, who forecasts this year won’t reach that total but should surpass the city’s average of $3.5 to $3.7 billion. Industrial cap rates ranged from 6.75 per cent in single-tenant, class-A buildings to 7.75 per cent in multi-tenant, class-B buildings, according to Colliers’ recently released first-quarter cap rate report for Montreal. The GMA industrial market’s overall vacancy rate slipped below four per cent in the first quarter, compared to seven per cent just five years earlier, and the economic prospects for this year seem favourable to the industrial real estate industry in Quebec with an expected increase in exports due to a lower Canadian dollar and continued economic recovery in the United States. Ville St-Laurent, west of Montreal, continues to expand and has the lowest industrial availability rate in the GMA. The south shore of Montreal has the largest amount of major construction — with new buildings in Varennes, Beloeil and Saint-Bruno-de-Montarville — while continued population growth in Laval is encouraging large businesses to launch new projects. CBRE’s report shows cap rates for apartments ranged from 4.75 per cent for class-A high-rises to 6.75 per cent for class-B low-rise buildings. “Multi-residential is definitely the golden child of asset classes in Montreal and is particularly playing a strong defence role for investors based on very strong fundamentals that don’t fluctuate that much,” said Sieber. Cap rates for the retail sector varied from 5.75 to 6.75 per cent for regional malls and power centres, from 6.9 to 7.75 per cent for the community category, and from seven to 7.75 per cent for strip malls, according to Colliers’ report. “In retail we’re going through the same challenges as other cities in Canada, where you had big announcements about closings of stores like Target,” said Sieber. “But one of the good things about retail is that it adjusts very quickly. Cap rates for downtown full-service hotels ranged from 7.5 to 8.5 per cent in CBRE’s report. Rates for suburban limited-service hotels were between 9.25 and 10.25 per cent and focused-service hotels had rates of from eight to 8.75 per cent.